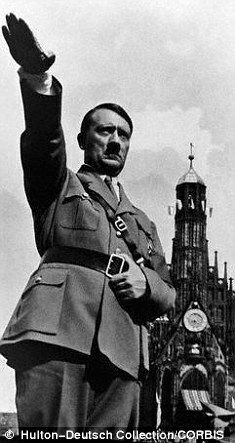 Austrians are shocked by a new survey which shows that one in ten young people think Adolf Hitler was not all bad and that he did some 'good things'. Many are also anti-immigrant and anti-foreigner despite years of multi-cultural teaching in schools. The country's Kurier newspaper called the findings by the Youth Culture Research Institute 'frightening' - particularly as it is coupled with the general mistrust and dislike of non-Austrians. Austria has struggled with its relationship to Nazis in general and Hitler in particular ever since 1945. The country was taken over by Hitler - himself an Austrian by birth - in 1938. Welcomed by euphoric crowds at the time, post-war Austrian retreated to a psychological comfort zone whereby they classified themselves as the 'first victims' of the regime. The new survey asked youngsters aged between 16 and 19 what they thought of the dictator. Pollsters were astonished when 11.2 per cent of them said that Hitler 'did many good things for the people'. And one in four of them believe there are 'too many Turks' in Austria, the predominant immigrant group. 'Young, open, tolerant? The ideal of an open, socially minded younger generation remains, as a current study shows, an illusion,' said Austria's Standard newspaper. 'Too many Turks live in this country,' said 43.6 percent of the respondents. Perhaps more sinisterly, in a statement that harks directly back to the Nazis, 18.2 per cent of them declared that 'Jews have now, like before, too much influence over the world economy'. It was feeding on prejudice like this in the socially depressed atmosphere of the 1920s and 30s that allowed the Nazis to demonise Jews, isolate them and finally exterminate them on a massive scale. The Youth And Zeitgeist study was carried out among 400 young people in the capital Vienna - the city where Hitler lived as a down-and-out in the days before WWI and where his hatred of Jews flourished. Those who carried out the survey said that the most extremist views were expressed by the less educated - but they said that even well-educated youngsters harboured extremist viewpoints but expressed them in more 'subtle' ways. In total, 40.5 per cent of respondents agreed with the statement that 'for many immigrants, the Austrians are viewed as a lesser people'. This, again, is a viewpoint straight from the textbook of the original Nazis. They expressed great fears for future job prospects and felt that Turkish immigrants were rivals to them for work, said study author Beate Grossegger. 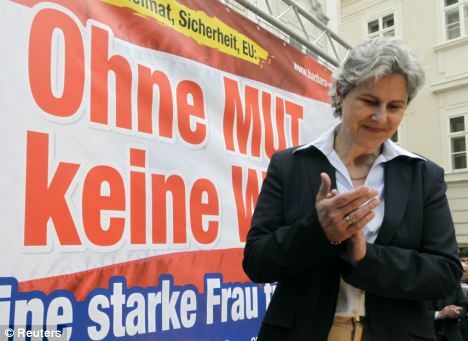 'Political education has failed,' she said while Bernhard Heinzlmaier, chairman of the institute, said xenophobia had 'arrived' among the well-educated young people of the middle classes. He blamed years of 'neo-liberally brainwashing' for their viewpoints.